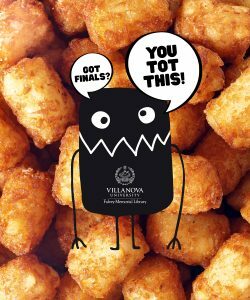 Falvey Memorial Library :: Finals 2017: You Tot This & the Library is Here to Help! Finals 2017: You Tot This & the Library is Here to Help! Feeling a bit stressed and anxious about final exams? Mark your calendars as Falvey will be co-sponsoring an exciting mix of events on Monday, Dec. 11 and Tuesday, Dec. 12 to help you relax and get that extra boost as finals approach. You deserve to take a break with us! We kick off the stress bustin’ fun on Monday, Dec. 11 with the Library’s open house from 12-3 pm in the first floor lounge. Falvey will be hosting a day featuring relaxing activities, good eats, and last-minute help from our librarians! We are proud to announce that the theme of this year’s open house is “You TOT This!” Why? Because we believe in you…and we also believe in the motivating power of tater tots. At the event, we’ll have a spud-tacular hot tater tot bar with all the fixings, video/board games, puzzles, coloring, ornament making and even a visit from Will D. Cat! During the event students will have the opportunity to enter a raffle to win one of the most lit “tater tot” blankets literally on the planet. What a perf way to relax before finals and get some extra motivation! The following day, Tuesday, Dec. 12, we’ll welcome our furry friends from Pals for Life from 1-3 pm in room 205 at the Stress-Free Happy Healthy Hours event, co-sponsored by POWER, Villanova Student Advancement and the Office of Health Promotion. Be sure to visit with the Pals for Life therapy animals, enjoy some relaxing activities like stress ball making and coloring and indulge in some free snacks! Finally, stop by the Reading Room lobby in Falvey Hall for Study Break with the Provost on Tuesday, December 12th from 3-4 pm. Provost Patrick Maggitti, PhD, will be there to cheer you on as you head into finals and offer some comforting hot cocoa and delicious treats. We hope you stress less with us as we head into finals! Remember: You TOT this! We are here to help.